Is it me, or are journals all the rage after the new year turns? 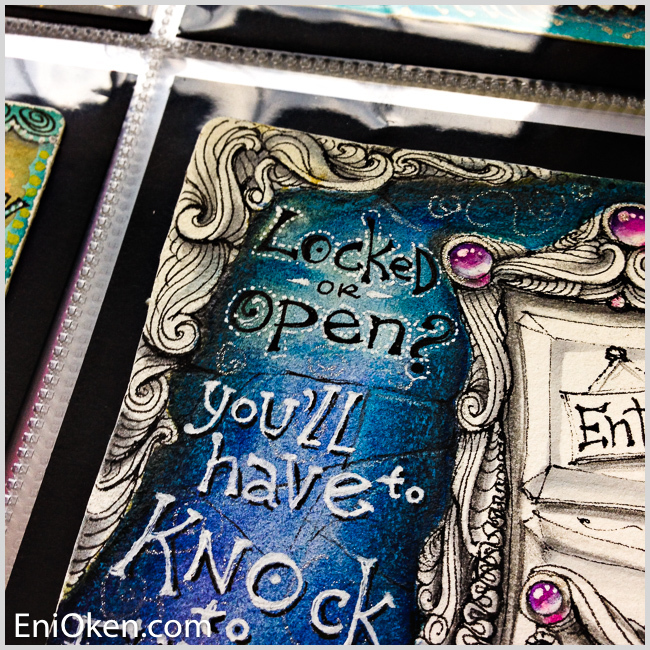 I'm participating in at least 3 or 4 different art journaling groups. The prompt for this one is PORTAL, and I decided to create a door instead of the all mystical stargates which the name traditionally invokes. I feel it begs a simpler question: will you go through it and enter, as the friendly sign beckons, or will the ominous looking keyhole keep you from entering? You have to knock and find out. This is your path alone to figure out. The door is surrounded by Echo Lines, some tangles and gems. The background was painted with watercolors, and the door itself was shaded with markers and graphite pencil. The text was added later using black inking pen and white gel pen. The tile, which measures only 3.5 inch square, will take its place in my 3-ring binder journal (you can get one at beckyhiggins.com), which already has some other tiles on the same page.